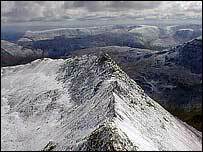 An avalanche warning has been issued for Helvellyn, England's third highest mountain, with climbers urged to stay away from the Cumbrian peak. The Lake District National Park Authority said unstable snow and ice at all levels of the mountain, plus gales, had made any ascent dangerous. "There is a high avalanche risk until the snow pack has time to consolidate," it warned. On Friday there was a wind chill of -15.9C on the 3,117ft (950m) peak. Fell top assessor Craig Palmer said: "High winds are moving the snow around and it's not bonding. "It's lethal underfoot as edges are literally breaking away. An added danger comes from a cornice of snow, which could break off and avalanche at any time. "I've rarely seen anything as bad as this in the Lake District and I would strongly urge people, even those experienced in winter mountaineering, not to venture out on to hills until the situation improves." The authority said that none of the climbs on the mountain were in a fit condition for climbing.